The work we do is simply not possible without financial support from people like you. We are grateful for contributions of any amount. Thank you for your tax deductible donation that makes it possible for us to continue the work of hope, healing, and peace … one stitch and one dollar at a time. 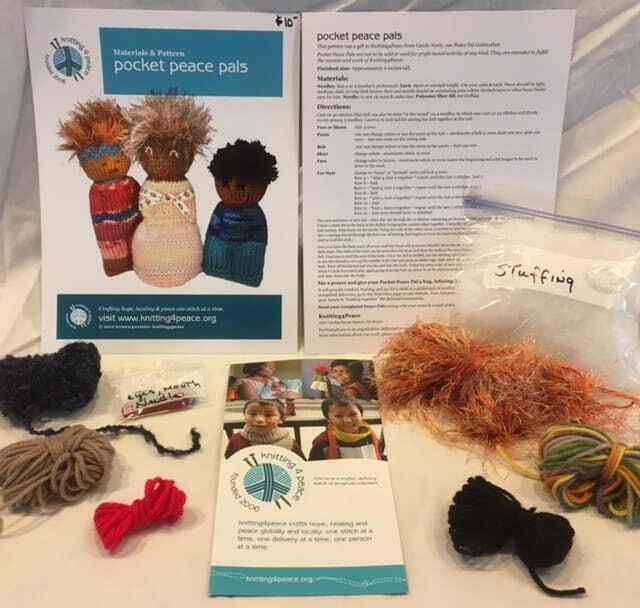 Knitting4Peace is a 501 (c)(3) non-profit organization. All contributions are formally acknowledged as fully tax deductible under IRS codes and regulations. 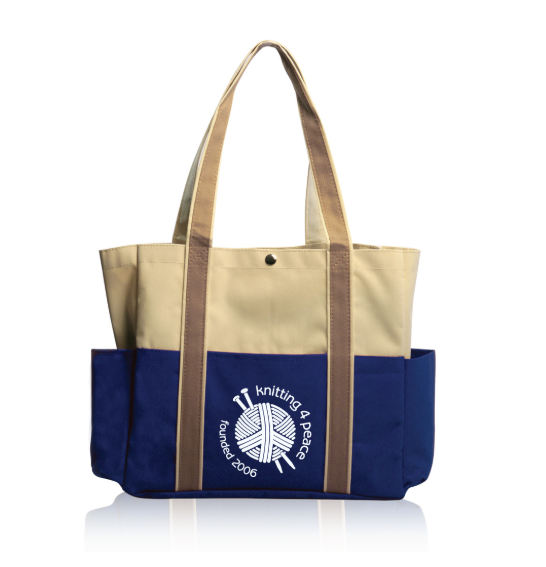 New Navy Blue tote bag! Help others to find out about our work in the world by toting your crochet and knitting projects in this durable bag. Our canvas tote bag (13”W x 12-1/4”H x 4” D) is large enough to carry your knitting or crocheting and a favorite book or two and has two (2) end pockets for your water bottle, as well as a handy pocket on the front . The reinforced straps are long enough to easily slip over your shoulder. The center snap offers a secure closure. $15 per bag plus $5 shipping. Our Angel Note Cards bear the message “Peace” in Hebrew, English, and Arabic on the inside flap, leaving room for your personal message below. The unique angel Peace Pals were created for this card by Reba Quastler. Back of card provides information about Knitting4Peace. Pack of 10 cards/envelopes, $10.00 plus $3.00 shipping. Each kit is $10.00 plus $3.50 shipping. Want to honor someone or a special event in someone’s life? Wondering what to give that special someone who is impossible to shop for (or who seems to have everything already)? We have a great solution! 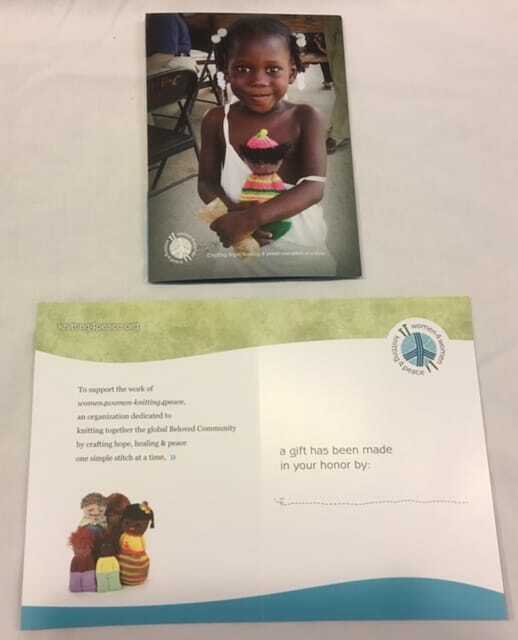 Make a donation to Knitting4Peace, tell us who/what it honors, and we’ll send this beautiful acknowledgement card that features one of our international delivery recipients. There are two easy ways to do this: (1) Make a donation through PayPal and tell us in the Comments box who/what you want to honor and the address we should send the acknowledgement card to; or (2) send a check to us with an enclosed note indicating who the acknowledgement card should be sent to (send your check to: Knitting4Peace, 2600 Leyden Street, Denver, CO 80207). Our 4-color brochure offers a brief introduction to who we are, what we do, and how to join our work. Photos illustrate local and global recipients as well as our multi-generational creators. Packs of 25 brochures available at no charge. Postage is $5 per pack.